Religion played a large part in Olmec life. First of all, the Olmec social system was theocratic--based on religion. Evidence of this statement is found in extensive construction of religious centers and sculptures. 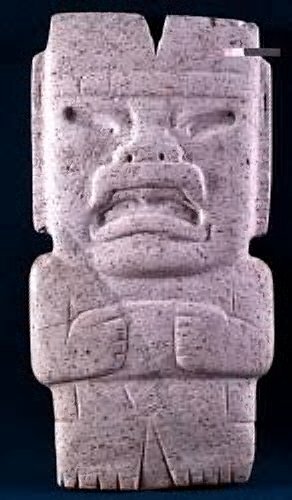 The Olmecs were believed to be polytheistic because of their varying sculpture figures; the Olmecs most likely also believed in natural spirits. They believed that the jaguar was a supernatural creature and also a werewolf-esque creature called the were-jaguar. The discovery of several adobe temples in La Venta also proves the importance of religion in Olmec life. The Olmec also practiced shamanism. They believed that each person has an animal spirit, and to fall into trances they licked the paratoid glands of marine toads, which acted as hallucinogenic drugs. The deceased noble Olmec were buried with jewels in jade plazas. As you can see, the Olmec performed different religious rituals.